I had a Baja, now I have a super deluxe. Well good luck with the interview (which you may well be having as I write). And as others have said, your logic is faultless! Big Tele fan here; used to be a Epiphone / Gibson player when I was in a band and always thought it ideal given what we were playing. But once I got a Tele (and now have 2), I never looked back; much more versatile I thought and better sounding anyway. A mate also has a Squire Tele (can't remember what model) and I agree with the comments above - it's a wonderful guitar and possibly hugely underrated due to its price. Let us know how you get / got on! I'm starting to think that I have a Tele shaped hole in my life too - gotta complete the holy trinity if nothing else. I had a Squier Tele which I sold last year. I have been asking myself "WTF was I thinking" ever since! How did the work interview go??? I'm sure I'm not the only person who hopes it went in your favour, sir! Also, got the Tele yet? garrettendi wrote: How did the work interview go??? I have two teles. I now need a third. ooo soory about the job, but your logic is working as planned! Gorgeous tele! I have four teles, one built by me so it only looks like a tele, a AVRI '62 in sea foam and two custom shops, one with hand wound pickups and that guitar will be cremated with me. Likewise sorry to hear about the job, but that is a nice bit of compensation. I have five teles: four yamahas (including two converted to Esquires, one set up for slide), one real deal US. I love Teles. Nice Tele!! 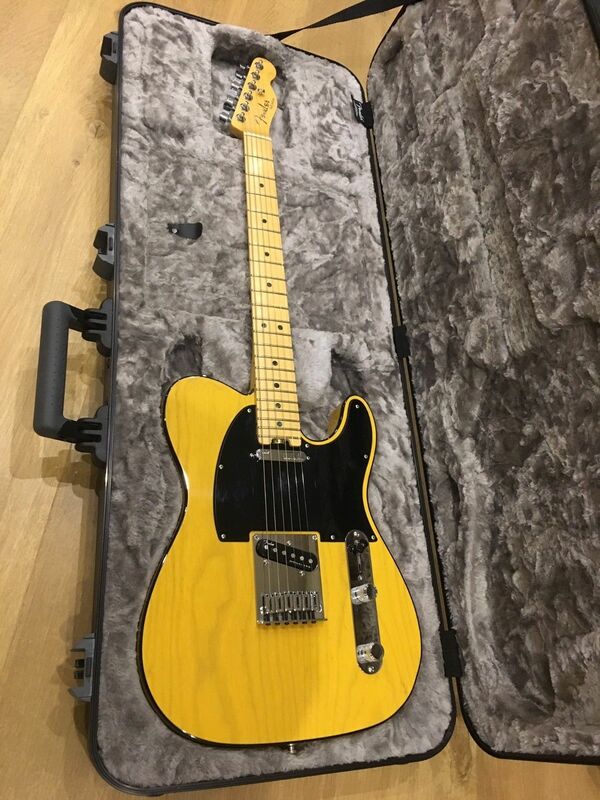 I absolutely LOVE butterscotch blonde Teles. The truss rod adjustment wheel is a welcome addition on the elite series instruments too I feel. + the case is lovely! I have a serious yearning for a 7 string, I'd love a 7 string Jazz Box or, this Selmer style that is on ebay just now. I definitely don't want a metal monster but I came across a 7 string Tele style from Thomann which looks quite presentable and is dirt cheap. As a proof of concept it may be just the job and it's not like Tele's don't have Jazz credentials with Ted Greene and Joe Pass playing them. A self-hacked together Frankentele, based on an £80 Winfield tele-alike I bought in Oxford years ago because I loved the neck profile. This now has decent Gotoh tuners and through body stringing to a compensated three barrel bridge, all topped off with a pair of Custom Shop 52 reissue pickups. It`s a bit good to play even if it doesnt sound like yer average tele. Who needs a real one? But I don't mind too much; just impatient to get my hands on it. I always thought people were daft when they went straight from one job into the next without a break, but I've discovered that when you're faced with the prospect of losing one, and you're invited to start another the day after, you tend not to hesitate. It's actually part-time...and I'm dreaming of the possibility of being able to scrape by on that with a lot more time to get on with doing some music instead of just thinking about it. Or at the very least, have more time to think about doing it. It even occurred to me that it might be possible to earn a little extra money from it...but no, that's an absurd idea...!